Price is an artist who creates real-time responsive animation. With his background as a filmmaker and animator, he emphasizes narrative and cinematic structure in his works with immersive and interactive storytelling. Utilizing video game technology and a combination of ready-made and custom hardware, he creates virtual environments and responsive spaces to explore alternative forms of personal expression in time-based digital media. 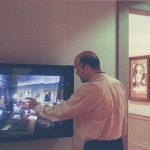 His animation and interactive work has been exhibited internationally and is on permanent display in museums of arc, technology, science, and history. He is currently a professor at the Ohio State University’s Advanced Computing Center for the Arts and Design.